Paul Sutter is an astrophysicist at The Ohio State University and the chief scientist at COSI science center. He also hosts "Space Radio" and the "Ask a Spaceman" podcast, leads AstroTours around the world and frequently contributes to Space.com's Expert Voices: Op-Ed & Insights. 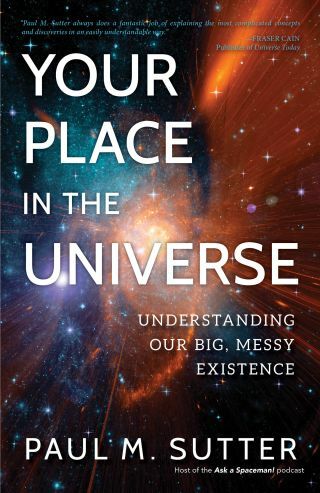 Sutter's new book, "Your Place in the Universe: Understanding Our Big, Messy Existence" (Prometheus Books, 2018), takes readers on an informative and entertaining tour of their cosmic home — the entire universe. Read a Q&A with the author here. You know, it's really hard to start the story of our universe at the place it should — the start of the universe — because strictly speaking, the universe doesn't have a beginning. Or maybe it does. Here's the problem. We live in an expanding universe. Every second of every day, galaxies are generally getting farther away from each other. Run the clock backward, and you quickly realize that in the past, galaxies were closer together. This is pretty straightforward logic, I suppose. Run the clock back further, and there aren't galaxies anymore — all the matter is too smooshed together. There's just a bunch of junk filling up the universe. Keep going, and eventually the entire universe, as big as it appears today, shrinks and shrinks to an infinitely small point. That is precisely what general relativity, our mathematical tool for understanding the evolution of the universe over these almost incomprehensible timescales, tells us: that at a finite time in the past (spoiler alert for later chapters: around 13.8 billion years ago), the universe was compressed into a singularity, a point of infinite density. Of course, that's wrong. Nature doesn't like infinities. But we have to separate what nature actually does from how we model it. Physics is a mathematical description of the world around us. And that mathematics provides a wonderful tool. For one, math compacts vague natural-language sentences into precise, meaning-filled equations. You could go on and on about how a wave of electromagnetic radiation propagates (and in fact I'm probably going to do that later) without getting all the details right, simply because English isn't really equipped to describe it. But a couple of neat equations can do all the work for us, summarizing and describing in one elegant go. Math also forces logical consistency, which is handy when a physicist wants to make predictions. "If we assume this is true based on the evidence, then that must happen" is a soothing statement that calms us during bouts of midnight existential dread. But it does have its shortcomings. We can only provide approximate descriptions of nature, because we are fundamentally limited by uncertainties in measurement. Sometimes those approximations are really, really (really) good, so we don't care about the discrepancy anymore. But sometimes the math is so broken, so dysfunctional, that we can't use it to piece together what Mother Nature is whispering to us at all. Singularities are actually pretty common, at least in mathematics. If I model the force provided by a simple spring, I can use Hooke's law: The more I compress the spring, the harder it will push back on me. But if I were to compress it all the way, so that the spring was a single point, the force pushing back on me would be infinite. That seems like a dumb thing to say, but that's what Hooke's mathematics tells us. But duh, you can only compress a spring just so far until some other force takes over — like, say, the electric repulsion of the atoms in the metal, preventing them from squeezing down to infinity. The singularity appears in the math, but nature knows better. Now take this example and replace Hooke's law with general relativity, and the spring with the entire universe. Welcome to the cosmologist's nightmare. Einstein's theory of general relativity is fantastically easy to state: we all live embedded in space-time. The presence of mass or energy distorts space-time "underneath" it (in a three-dimensional sense, but there aren't any good English words for it), and that distortion tells other matter how to move. Put two kids on a trampoline: they can affect the motion of each other without touching. Now imagine that in four dimensions, and you have gravity. It's almost funny how a somewhat benign statement like the one above masks such a horrible snake pit of mathematics. General relativity itself is a set of 10 complicated, interwoven equations describing the detailed relationship between space-time and matter and energy, plus some more equations governing how objects move. Heavy stuff. General relativity is the story of gravity, and at the very largest scales (i.e., bigger than galaxies), gravity is the only force with enough oomph. It's incredibly weak but affects all matter and energy across infinite range, and it's that staying power that provides its dominance at large scales. On balance the universe is neutral, so the electromagnetic force cancels out. The strong nuclear force peters out past an atomic nucleus, and the weak nuclear force is, well, weak. When it comes to cosmology, only gravity matters. Cosmology is the story of gravity at large scales, and general relativity is just fine and dandy for describing that gravity — giving us the very history of our cosmos. But there are singularities lurking within Einstein's greatest hit. We use general relativity to understand the evolution of our universe, and those mathematics say — and logic tells us — if we live in an expanding universe (and we do! ), then at one time in the past, everything was crammed into an infinitely dense point. Unless something got in the way. Unless something prevented or replaced the inevitable collapse, stopping the universe from becoming infinitely dense — just significantly or even stupendously dense. Anything but infinite and we can handle it. And in fact, something must prevent it. We know that singularities don't actually appear in nature; they are flaws in our model of reality. So general relativity draws a line in the sand: we could mine the entire universe for information, extract every single bit of useful data from our observations, but we will never, ever understand the earliest moments of the universe unless we try some other tool in our mathematical toolbox. When it comes to the first 10−43 seconds, we simply have no idea what's going. It's here where speculation reigns. We have a relatively firm grasp of the history of the universe, but not its origins. Or even if origins is the right word. We haven't (yet) developed the mathematical language to describe these initial moments. Or even if initial is the right word. Maybe there's more "universe" happening before what we call the big bang (as you can see, this term is meant to describe not the birth of our universe but its very early history). Maybe the very concepts of space and time break down. Maybe there's no such thing as "before" the universe. There are a lot of speculative ideas beyond our known physical laws floating around in the minds of physicists and their arcane academic journals. Maybe string theory has an answer here, or was it loop quantum gravity? Who knows? The singularity draws the eye of the theoretical physicist because it's an unambiguous signpost that there's more to be learned here. For all other times and scales in the universe, we have at least some guidance on how to proceed. But in this moment, when the universe has a temperature of more than 1032 Kelvin and is no bigger than 10−35meters across, we don't have much to guide us. In other words, imagine how long it would take to stretch out your arms so wide that you could hug the present-day universe. The Planck-era universe would have to do that a billion times over to give you a friendly squeeze. I'm sorry — there just aren't a lot of useful analogies for these sorts of situations. The temperatures, densities, and length scales in operation at the early stages of our universe aren't something we normally come in contact with, so we don't have handy metaphors or explanatory tools at the ready. Usually in these situations we can instead appeal to the mathematics to guide us, like a distant lighthouse in a storm of nonsense, but even here the light is gone out. Excerpted from "Your Place in the Universe: Understanding Our Big, Messy Existence" (Prometheus Books, 2018). You can buy the book on Amazon.com.